Foie Gras: Savory Delicacy or Gourmet Cruelty? For many, seeing “Foie Gras” listed on a menu is a treat in of itself. Traditionally reserved for dishes showcasing the crème de la crème of the culinary world, a diner’s access to this exclusive delicacy was once dictated primarily by one’s access to funds. However, this decade has seen the reemergence of and reinvention of many such edible indulgences and foie gras in all its forms is beginning to pop up on menus all over the country. It seems, though, that for every restaurant that serves this “fat liver,” another is scratching it off the menu. But why? The international culinary world is being split down the middle over ethical questions concerning the current process of harvesting these prized goose and duck livers, and diners are being asked to take a side. But before we drop our forks in protest, or simultaneously order the pate’ in a united front of support for the dish, it helps to educate ourselves on the issue. Meaning “fat liver” in French, foie gras is made from the enlarged liver of goose or duck. The animal is force fed, or gavaged, in order to change the texture and flavor of the liver. Many people describe the flavor as buttery, delicate, and rich. Once extracted, the liver can either be served whole, or served as a pate‘ (the least expensive), parfait, or mousse. While few may deny the appeal of this decadent dish’s taste, many people are outraged by how it is achieved. The act of gavaging geese and ducks is incredibly controversial. Advocates argue that the birds go through similar natural periods of gorging in order to pack on the pounds before seasons of migration, while opponents maintain that force-feeding procedures are traumatizing, and cause long-term health issues in the animals. Both sides of the issue have valid points that deserve the attention of diners. 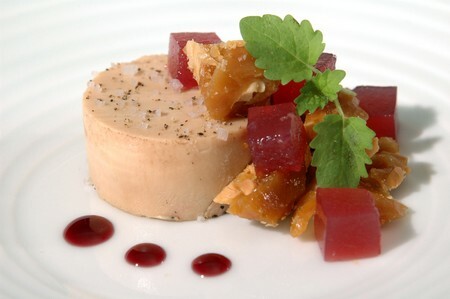 Foie gras enjoys a rich history that has spanned the ages. Ancient relief carvings in the tomb of the important Egyptian official, Mereruka, depict workers forcing feed down the throats of geese. While it is impossible to know whether ancient Egyptians actually enjoyed foie gras specifically, it is helpful to understand what role gavaging has played throughout history. We must credit the ancient Romans for being the first to serve up what we now consider foie gras. In fact, it is said that Emperor Elagabalus’ dogs were even so lucky as to get their chops around this fine treat. Much later, around the Fourteenth Century, the promotion of poultry fat as a substitute for lard or butter in Jewish cuisine eventually led to the appreciation for goose liver. The rest is not-so-recent history: as the taste for fattened goose liver spread throughout Jewish communities, it also won over the palates of outlying populations. The production and consumption of foie gras was truly embraced and mastered by the French, and as of 2005, they manufactured 78.5% of the world’s supply. They continue to be the leading producers today, and Hungary is the leading exporter of this notorious food product. Another institution to stand up against the practice is the entire Wolfgang Puck brand. In 2007, the celebrity chef officially announced that foie gras would no longer be offered in any of his 14 fine-dining restaurants, 80 casual eateries, or 43 catering venues. The campaign is coined “Wolfgang’s Eating Loving and Living” (WELL), and is supported by the Humane Society of the United States (HSUS). Puck is quick to point out that WELL reflects his interest in offering socially conscious and better tasting food, but one might wonder if the three years of protests and negative publicity he received from Farm Sanctuary, an animal rights group, had anything to do with his change of heart. The same year Wolfgang Puck bowed to the demands of protesters, other chefs rose up to counter the attack. In October of 2007, around 20 restaurants in Philadelphia added $5 foie gras selections to their menus in an act of solidarity as “Philadelphia Chefs for Choice.” The chefs were not only hoping to counter claims that the process of gavaging is inhumane to the animals, but they were also acting out against the protesters themselves – many chefs claimed that their staff, customers, and families were brutally harassed by animal rights groups. Chef David Ansill described the antics of protesters as “almost terroristic.” In regards to the supposedly traumatic act of force-feeding the birds, many chefs and supporters of the industry accept the claims of men like Ariane Daguin. The owner of the largest purveyor of foie gras in the US, D’Artagnon, noted, “It seems terrible if you don't know that a duck's esophagus is lined with a very thick cuticle, if you don't realize that baby ducks are fed by their mother pushing her beak down the baby's throat." The American Veterinary Medical Association’s House of Delegates and the American Association of Avian Pathologists both conclude that foie gras is not a product of animal cruelty. Celebrity chef and writer Anthony Bourdain offers his own frank, if not slightly oversimplified, view on the subject by noting that no meat product comes cruelty-free.